Pacal Votan is Allah’s messenger, ‘time’s special witness,’ appointed to supervise humanity on Judgement Day. Judgement Day is the moment of truth common to all humanity when Earthly Hell is filled to the bursting point, exploding all at once the complex web of illusion binding humanity to its own end time. 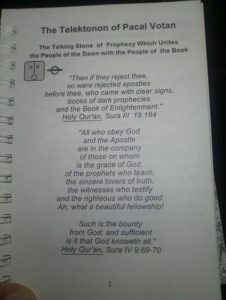 The ‘Judgement Day Plan’ is the fulfillment of the command of Allah’s Judgement Day supervisor, Pacal Votan. The command of Pacal Votan is manifest through the indisputable instruments of the Thirteen Moon Calendar, Telektonon, and Dreamspell, the Journey of Timeship Earth 2013, as well as the accompanying documentation: ‘The First Planetary Congress of Biospheric Rights: New Covenant and Resolutions,’ ‘Thirteen Moon Calendar Change Peace Plan: Pax Cultura Pax Biospherica,’ and ‘The Call of Pacal Votan: Time is the Fourth Dimension.’ The Judgement Day Plan is the final dispensation awarded by Allah to enable humanity to complete its spiritual mission on planet Earth. Judgement Day consists of the Seven Years of Prophecy, July 26, AD 1993-July 25, 2000. This is the time allotted to humanity to wake up from its moral catastrophe, relinquish its old ways, and set itself firmly on a righteous course based on a new Covenant and a new time. Following Judgement Day is Heaven on Earth, the return to the Garden. This unprecedented change in the course of human affairs is totally due to the fact that it is Judgement Day. The arrival of truth is the trumpet that announces Judgement Day. The truth is that humanity is living a gross, manifest error in time. Living this error heedlessly has brought humanity’s own judgement upon itself: social chaos and disorder, inequity and iniquity of power; exaltation of war as the measure of peace; and the pollution and exhaustion of the biosphere. Totally exceeding its measure, thoroughly incapable of being able even to understand what it has done to itself, humanity has brought its judgement upon itself. This judge-ment is the truth revealed through Pacal Votan, the truth that separates humanity’s false conception of time from the true divine order of time. This truth is both the destroyer of the false and the creative path of the righteous. The Judgement Day Plan of Pacal Votan is Allah’s mercy and revelation of the divine plan to overcome the falsehood of living for millennia according to a manifest error in time. True time is the creative instrument of the divine will, the law by which all the orders and levels of the cosmos maintain their harmony. The fifth force is the synchronizing power of time, at the center of which is always the constructive power of genuine peace. The conclusion of Judgement Day and the execution of the Judgement Day Plan can only flower as an era of universal, everlasting peace. Pacal Votan, the Great Pacal, the eleventh in succession of the ‘dynasty’ of Palenque, is that one permitted by ‘The Most Gracious’ to speak on Judgement Day. 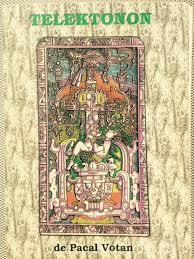 Pacal’s life in the New World realm of the Maya spanned 80 years from AD 603 to 683. 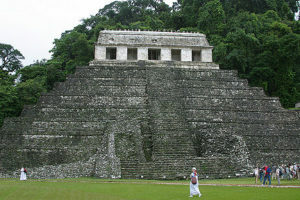 His reign was unique and, with the succession of his son, Chan Balum, who completed Pacal’s vision, Palenque was converted into one of the principle artistic and cultural centers of the entire planet. The time of power of Pacal Votan was a 52-year cycle between AD 631-683. In the Mayan ‘long count’ this cycle of power occurred between kin 1 366 560 and kin 1 385 540, and constitutes precisely the 73rd 52-year cycle since the commencement of the long count, BC 3113. Upon Pacal’s death, a monumental tomb and sarcophagus were designed, over which the nine-story pyramidal Temple of the Inscriptions was constructed. The nine-year project was completed in AD 692, or baktun count 9.13.0.0.0. 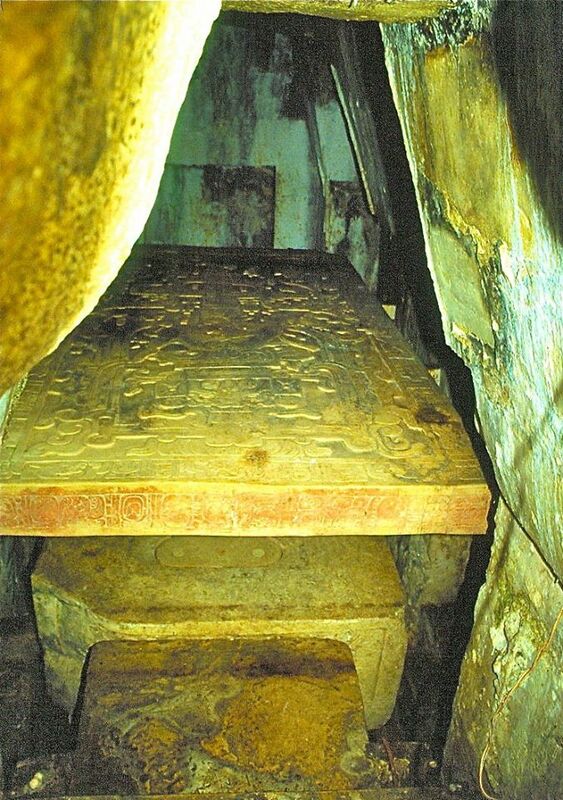 The tomb, its dedication date, and its discovery, exactly 1260 years later in AD 1952, are in themselves signs of Pacal’s teachings. By his tomb and the monuments he left behind, the Great Pacal was the most outstanding personality of the great era of the Maya, AD 435-830, (baktun 9.0.0.0.0-10.0.0.0.0). Totally apart from all of the trade and imperial traffic of the Old World, the Maya distinguished themselves in the New World with a culture of supreme artistic refinement and an astronomical mathematics unique among all peoples of the planet. The original Maya who built their centers of thought and culture throughout Central America and Mexico, were following a stream of consciousness deliberately brought to this planet for a specific purpose. 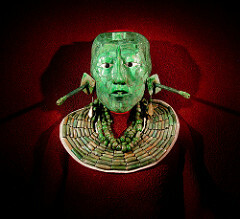 In a word, the original Maya were superior messengers of the instrument of divine will, which is time itself. Universal Religion is the measure of spiritual unification attained by intelligent species throughout the different world systems of this and other galaxies. Though Pacal was human, his wisdom and spiritual knowledge were refined in most excellent ways, especially owing to the vast skill in the knowledge of time. The true knowledge of time is a doorway to other dimensions and other worlds. By his preparation and mastery of higher spiritual practices, meditation, telepathy, and profound displacement, Pacal Votan was able to gather the information he needed concerning the spiritual progress, or lack of it, and level of cultural universality among the human species in order to make the final determination for his tomb and prophecy, Telektonon. The evaluation of Pacal’s mission is the prophecy, Telektonon. 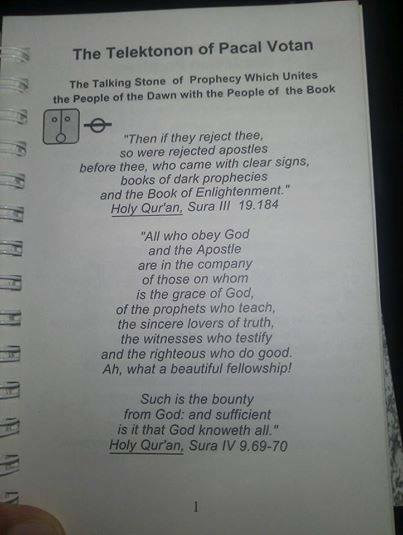 As Pacal Votan’s evaluation of the progress and development of Universal Religion on the Earth, the Telektonon cannot be separated from the Mission of the Prophet Muhammad and the rehearsing and compilation of the Holy Qur’an, the Earthly Judgement Day Book. The Qur’an was completed just before the death of the Prophet, AD 632, one year after Pacal Votan had entered his time of power at the age of 28, in AD 631. To lead a universal life, we must do our best to be absolutely positive, radiating love into our environment.